The incredible world of the Batman: Arkham Asylum video game has become so iconic, it's impossible not to immediately recognize its unique style. Now the most classic piece of that world can be displayed on your desk, no console needed. As part of the DC Collectibles Gallery Collection this Batman cowl stands apart in that it is based on one of the most critically acclaimed Batman video games of all time, Batman: Arkham Asylum. 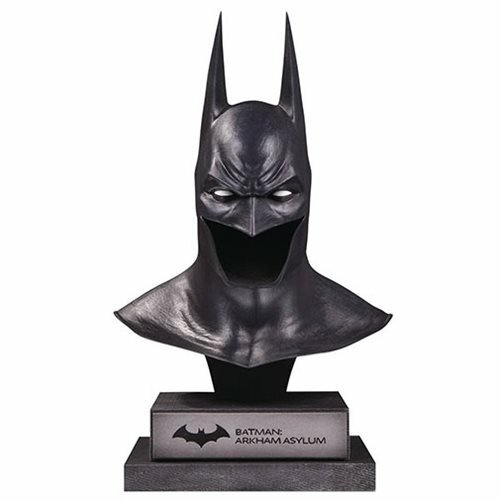 Standing approximately 8 1/2-inches tall, this 1:2 scale bust-style poly-resin statue makes for an imposing addition to a home or office, ideal for fans of the video games featuring the Dark Knight. The DC Gallery Batman Arkham Asylum Cowl Statue is a limited edition of 5,000 pieces. Designed and crafted under the highest quality standards, the DC Gallery collection reproduces some of the most iconic props and collectible art from the DC Universe that makes a bold statement to any DC fan!